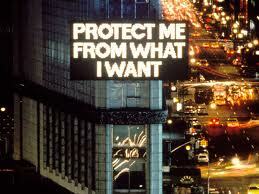 Jenny Holzer, “Truisms”, projected in Times Square in 1982. 1. Firstly say no to the sulky inarticulate artists – that’s something else – a caricature of insecurity. If you can’t talk clearly about your work, and if no one else can, than go home. 2. There is a zen saying about extraordinary practice and discipline. Art is hard work. 3. It involves giving back – education. Be inspired to share your knowledge with those younger than you, and those who have yet to benefit from the power of art. 4. It’s not the romantic notion of artist under the influence loner, more an artist is someone who puts the sign of the times into real images. 5. Studio practice is sacred – be attentive to it as you would a dentist in a dentist office – you have tools, you need to focus, and you need to be real.